This is a spectacular time of late spring where everyone finds the beauty of gardens a refreshing and welcome gift for our senses. Vibrant colors, textures, and amazing scents of flowers and herbs melt those cold weather memories. We have always loved gardening, and celebrated the beauty of having our hands in the soil, picking weeds and primping flower beds. We get our best ideas visiting other gardens, and gain tips on improving our yard with techniques and creativity others model. 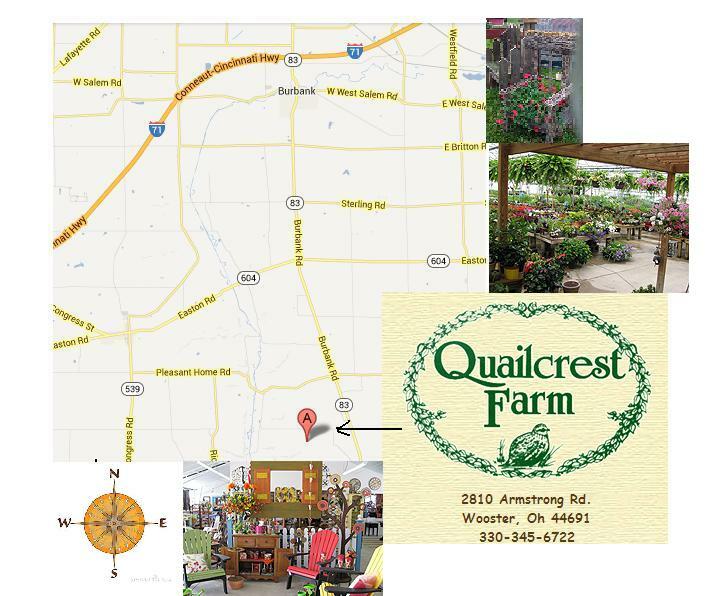 One such place for ideas is Quailcrest Farms, located on Anderson Road in Wooster, Ohio. There are amazing greenhouses to browse through , and expert gardeners working there to make your decisions easier. And a gift shop that is loaded with wonderful things for garden, and gardener too! It is a wonderful retreat from the busy world we live in to take that drive to Wooster. And drive to wooster will be in our plans for this weekend. Steve and I are excited to announce we were invited to be vendors at Quailcrest’s Garden Fair this weekend. If you are a gardener, and would just love to find that perfect plant, tool, or decorative item for your garden please think about visiting the event. We will be there with a full array of our soaps, mens shaving products, wire crochet jewelry, and hand dyed silk scarves. And hopefully we will be bringing home something new for our yard….that will last for years.